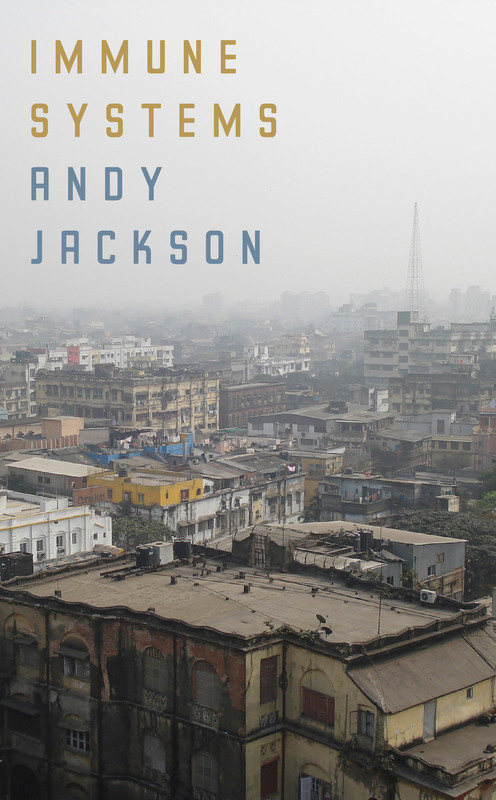 In Andy Jackson’s new book, Immune Systems, we are shown India through three distinct lenses. Section one sees the Indian urban landscape through an overseas patient who is there to receive treatment and recover, whereas sections two and three use formed poetry as links to the country: haikus and ghazals, respectively. The haikus offer a break from the heaviness of the first section, consisting mostly of tiny Japanese odes to mosquitos. The final one, not about a mossie, is ironic existentialism, bringing us back to Jackson’s emphasis on his own identity in a country crammed with so many others. Perhaps it is because they are earlier poems (written 2008-9) or perhaps it is because they differ so much from the poetry in section one, which came out of a 2010 Asialink grant thus had a project focus, but the ghazals of section two lack both personal and political investment in relation to the medical tourist poems, so I don’t want take up time talking about them. I’d rather focus on the poetry in section one; it is those poems that I feel make Immune Systems such an important book and show Jackson, too, to be such an important poet. The book opens with ‘Apollo Hospital’ – as much an invitation from Jackson to his readers as it is an invitation from the hospital’s signage to Jackson – to enter the world of medical tourism in India. Traditionally a scheme where people from underdeveloped countries travel abroad to receive better medical treatment from under- or less-developed countries, medical tourism now includes people from developed countries travelling to underdeveloped countries to receive cheaper medical treatment, which is the case in Immune Systems. In ‘Apollo Hospital’ there are brief glimpses of the surrounds, and they are those crowded, sensory-laden images we expect from a foreigner in India, a place where things break down, and it is not only bodies: umbrellas, bricks, ‘[t]he tamarind tree barely holds its seed pods’ (23). But Jackson’s purpose is not to offer city-street clichés of India. Throughout the poem he is focused on the hospital, telling us to cross the street, take a left, bypass the first building that might be mistaken for a hospital, pass a plethora of vendors. With all these directions, there is a sense that we do not want to get lost, that we must make it to the hospital. This line not only shows the inadequacies of language when describing the trauma of the body, but also seems to suggest the monotony of yet another procedure for someone so accustomed to surgery, as if he is saying, ‘does it matter which part of my body has been affected?’ This duality of meaning can only be achieved by avoiding the pathos so easy to embrace when trying to describe illness. take poison, give sleeping pills to their two children. At the entrance to the ambulance bay, another shrine. On the waiting room wall, a crucifix. From the internet café, above the traffic, the call to prayer. A man, on a nearby rooftop, does push-ups. Whatever exists in the universe, exists in the human body. when her body resists the medication. ……………………..or worse, that they already have. This couplet sums up what Immune Systems says to me. Poetry urges readers to feel, but good poetry does so while also forcing readers to think, to consider the human condition by way of the world around us. In this book Jackson not only shows us his own vulnerability through a needy, faltering body, but also through his questioning of ‘Why me? Why not them?’ in which the case of vulnerability is transferred to those around him, revealing a greater vulnerability of human kind, that which could be thought of as a question of identity, that which could also be termed as compassion. And because he can see his world and that of those around him with a fluid and, dare I say, balanced eye, his poetry holds great power. I highly recommend this book.